Occasionally we need to define piecewise functions, e.g. Today we examine a few ways to define a function like this. This works, but the function is not vectorized, i.e. f([-1 0 2 3]) does not evaluate at all, you get an error. You can get vectorized behavior by using the arrayfun function, or by writing your own loop. This doesn't fix all limitations, for example you cannot use the f1 function in the quad function to integrate it. We can use the logical arrays as masks on functions; where the logical array is 1, the function value will be used, and where it is zero, the function value will not be used. % now we add the functions, masked by the logical arrays. And now we can integrate it with quad! The Heaviside function is defined to be zero for x less than some value, and 0.5 for x=0, and 1 for x >= 0. 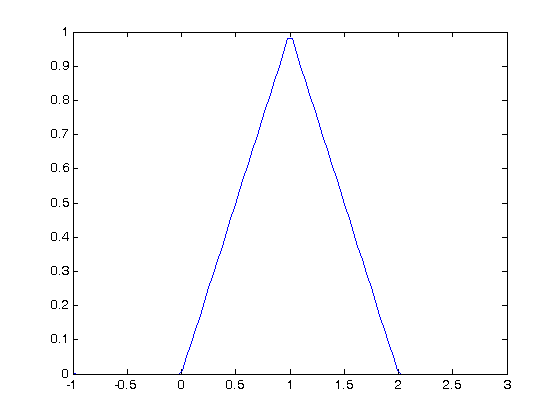 If you can live with y=0.5 for x=0, you can define a vectorized function in terms of Heaviside functions like this. There are many ways to define piecewise functions, and vectorization is not always necessary. The advantages of vectorization are usually notational simplicity and speed; loops in Matlab are usually very slow compared to vectorized functions.